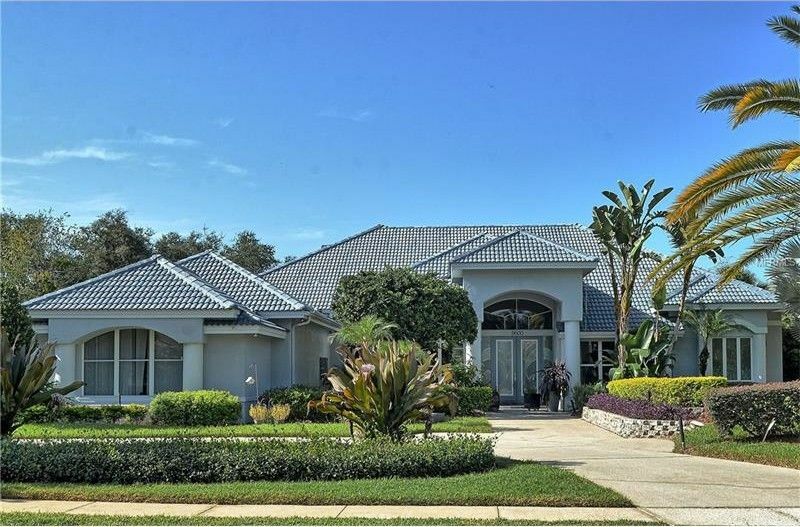 SPECTACULAR Estate Home on over one half acre in the heart of Dr. Phillips!!! This property has gone through a complete transformation... you will be truly impressed from the moment you enter the circular drive! The grand entry has a custom slate and stone inlaid tile floor with a stacked stone feature wall. The open floor plan offers clean line-of-sight through all public rooms to the expansive lanai and pool beyond. All public rooms have natural edge travertine flooring and the home has separate living and dining rooms. The kitchen is a chef's dream with granite counters, new tile back splash, custom wood cabinetry, a massive raised breakfast bar, cooktop with pot filler, wall oven and microwave plus built in desk... it is completely open to the family room with a fireplace as the focal point with stacked stone façade. The master suite opens to the pool area and has a bath that is spa-worthy- all custom cabinetry, dual vanities with built-ins, separate walk-in shower with state-of the-art digital shower controls and a raised spa soaker tub. Two of the guest bedrooms have en suite baths with custom tile, counters and cabinetry. Additional features/upgrades include: over-sized pool and lanai with summer kitchen; dedicated den/office; 3 car side entry garage; full service laundry room; built ins and tons of storage space through out; 2 newer AC systems; new pool and spa pumps; LED recessed lights; hand scraped engineered wood flooring; professional landscaping and so much more!